Get a goodnight sleep. The most common reason for poor sleep is difficulty in falling asleep and staying asleep. Many drugs used to treat insomnia can also impair memory. The Indian Medical Association (IMA) has issued directions to the 10,000 healthcare facilities and 2.5 lakh doctors it represents that it will initiate action against those physicians and establishments found hiring homoeopaths and ayurveda practitioners to fulfill allopathic functions. The decision to call for a ban was taken by IMA's central council last week and has been communicated to all its members. The notification stated, "Directions are being given to hospitals and doctors not to appoint Ayush (Ayurveda, Yoga & Naturopathy, Unani, Siddha and Homoeopathy) Doctors as Resident Medical Officers (RMO)/Assistant. Strong action will be taken against those violating the directions". IMA could revoke the membership of a doctor or institution found flouting this directive - outcasts will lose the support of IMA in battling medico-legal and malpractice cases. "It is a simple and clear message to our doctors. No ayurveda or homeopathy practitioner should be hired as an assistant or as an RMO in any allopathic medical set-up," Dr KK Aggarwal, senior national vice-president of IMA told Mumbai Mirror. "Such cases have only increased across the country in the past few years which forced us to call for the blanket ban," said Aggarwal. Incidentally, the state government recently passed a bill which allows those practicing ayurveda and homoeopathy to prescribe allopathic cures upon completing a year-long bridge course called 'Certificate Course in Modern Pharmacology', which will be designed by Maharashtra University of Health Sciences (MUHS). "If a homoeopath or an ayurveda practitioner stops practicing his own stream, he is obviously degrading it. Even if they do that course, our stand will remain the same. As far as the issue of shortage of doctors is concerned, the government should increase the number of medical seats instead of allowing this," said Aggarwal, adding that doctors flouting these norms will lose their IMA registration. Many Indian courts have excoriated homeopaths and ayurveda practitioners for prescribing allopathic medicines. In a 1996 case of medical negligence, in which a homoeopath's prescription of allopathic treatment to a man afflicted with typhoid resulted in the patient's death, the Supreme Court, which adjudicated, said: "A doctor must not only be qualified but he must also be registered with the appropriate Medical Council in order to practice as a doctor. A homeopath would not have knowledge about allopathic medicines and its drug reactions. So the mere administration of allopathic treatment by a homeopath would be enough proof to establish negligence." Senior eye surgeon Dr T P Lahane, a medical professional of 32-years' experience, and head of the state-run JJ Hospital, was of the opinion that allowing homeopaths or ayurveda practitioners to administer modern medicine is extremely unjust. "If they have not learnt the science thoroughly and extensively, they cannot be allowed to practice it so easily," he said. However, those Ayush doctors that are the target of the IMA's ire point out that they fulfill a vital need. "These modern medicine practitioners who are making so much noise should survey the hospitals and see who is treating the poor in Primary Health Centres in rural areas," said Dr Bahubali Shah, administrator, Maharashtra Council of Homeopathy, adding there are over 60,000 homeopaths, 81,000 ayurveda practitioners in Maharashtra, as against 1.21 lakh allopathic doctors. "We are not simply asking for permission to practice allopathy. We want to do it legitimately by doing the course." The Indian Medical Association (IMA) Friday issued a set of guidelines to tackle swine flu and urged citizens not to neglect minor cases of fever with breathlessness. It said in its guidelines that the matter is important as the current seasonal influenza vaccines are not expected to provide protection against human infection with avian or swine flu viruses. "However, reducing seasonal influenza risk through vaccination might reduce the theoretical risk for recombination of influenza viruses of animal origin," it said in a statement. The guidelines were launched by IMA president Marthanda Pillai and secretary general K.K. Aggarwal here Thursday. According to the IMA, a total of 10 deaths in Hyderabad and one death in Delhi have occurred due to swine flu so far. Delhi has reported 39 cases of Swine flu since last year. According to the IMA, swine flu can have symptoms like fever, coryza, cough, sore throat and body aches. It may last for one-two weeks. However, occasionally, nausea, vomiting, diarrhoea and rash may also occur. The government has designated both government and private labs to test the presence of virus, it said. "The government has also set a control room - 23061469. People, for any kind of information on swine flu, can contact it," it said. It said that swine flu can be prevented by adhering to cough and respiratory hygiene. One should avoid coughing over hands or handkerchief and use a disposable paper instead. "Frequently hand wash should be done if hands get contaminated with any secretions," it said. "People should avoid touching face, mouth and nose with dirty hands, avoid touching or having close proximity with any person who is coughing or has cold, and avoid shaking hands. Patients, who have symptoms should stay indoors and avoid crowded places," it said. New Delhi: Two fresh cases of swine flu were reported in the national capital today, taking the figure to 41 since last year. Two women, aged 35 and 53, residents of C R Park and Chattarpur, have tested positive for H1N1 (swine flu) virus, according to the officials from the health department of Delhi government. "The 35-year old woman is admitted to a private hospital in Kalkaji while the 53-year old is admitted to Fortis in Vasant Kunj," said Charan Singh, Additional Director (Public Health). One case of swine flu was reported on Thursday also. Delhi Health Secretary S C L Das today reviewed the situation and held a stock taking meeting with all the designated hospitals. The Indian Medical Association (IMA) meanwhile has issued a set of guidelines to tackle swine flu and urged citizens not to neglect minor cases of fever with breathlessness. "The matter is important as the current seasonal influenza vaccines are not expected to provide protection against human infection with avian or swine flu viruses. However, reducing seasonal influenza risk through vaccination might reduce the theoretical risk for recombination of influenza viruses of animal origin," IMA said in a statement. According to the IMA, a total of 10 deaths in Hyderabad and one death in Delhi have occurred due to swine flu so far. Swine flu can have symptoms like fever, coryza, cough, sore throat and body aches. It may last for one-two weeks, said IMA. However, occasionally, nausea, vomiting, diarrhoea and rash may also occur. The government has designated both government and private labs to test the presence of virus, it said. The government has also set a control room - 23061469 - for any kind of information on swine flu, it said. The American College of Obstetricians and Gynecologists' Committee on Gynecologic Practice and have published updated recommendations in the January 2015 issue of Obstetrics & Gynecology. The US FDA has approved a combination of a cephalosporin (ceftolozane) and a beta-lactamase inhibitor (tazobactam) in an intravenous formulation has been approved for treating complicated intra-abdominal infections and complicated urinary tract infections in adults. This is the fourth antibacterial drug product approved by the FDA in 2014 and was designated as a Qualified Infectious Disease Product (QIDP) and was given priority review. With proper monitoring, kidney donation may be safe for individuals with high blood pressure, according to a study published early online ahead of the print edition of the Journal of the American Society of Nephrology. The US Food and Drug Administration (FDA) has approved liraglutide (rDNA origin (Saxenda)) injection as a treatment option for chronic weight management in addition to a reduced-calorie diet and physical activity. Situation: A 62�year�old�diabetic with coronary artery disease, on treatment for the same, comes for follow up. The vaccine vials must be stored at+2�C to + 8�C after reconstitution. The 0.1 ml. ID administration of cell�culture vaccine should create a wheal of at least 5 mm diameter with "peau de orange" appearance. If ID dose is given subcutaneously then there is a possibility of poor immune response due to low antigen load. This may be life�threatening. A third-generation transcatheter heart valve, Sapien 3 transcatheter valve, addresses issues with earlier valves and was associated with improved ease of use, accuracy of positioning and paravalvular sealing (J Am Coll Cardiol. 2014;64:2235-2243). The rates of mortality and stroke with transfemoral access are among the lowest reported and support further evaluation as an alternative to open surgery in intermediate-risk patients. Patients who were obese before developing heart failure lived longer than normal weight patients with the same condition according to a new study in the Journal of the American College of Cardiology that examined the "obesity paradox" by following obese and non-obese heart failure patients for more than a decade. Artemisinin-naphthoquine drug-combo should be considered for the treatment of children with uncomplicated malaria in settings where multiple parasite species cause malaria, according to Tim Davis from the University of Western Australia. Caffeine is the most consumed stimulant in the world. It is consumed in the form of coffee and tea. At present there is no scientific data for promoting or discouraging coffee and/or tea consumption in the daily diet. Short term benefits include mental alertness and improved athletic performance. Long-term benefits are dose-dependent. Caffeine is associated with a reduced risk of Parkinson disease, Alzheimer disease, alcoholic cirrhosis, and gout. Coffee, both caffeinated and decaffeinated, is associated with a lower risk of type 2 diabetes. 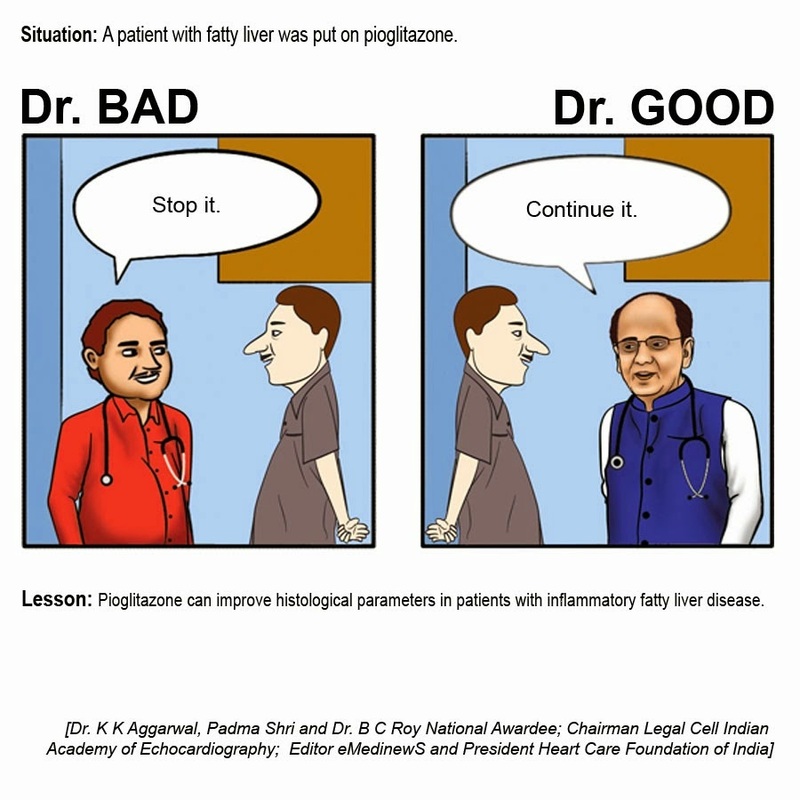 For patients over 50, doctors only need to monitor the upper systolic blood pressure, and can ignore the lower diastolic blood pressure reading, said Padma Shri, Dr. B C Roy National Awardee & DST National Science Communication Awardee, Dr. K K Aggarwal, President Heart Care Foundation of India and Honorary Secretary General Indian Medical Association. Systolic blood pressure � the top number in a blood pressure reading � is the pressure exerted at the beginning of the heart's pumping cycle, while diastolic pressure records the lowest pressure during the resting cycle of the heart. Both pressures are routinely measured when recording the blood pressure. As per a report published in the journal The Lancet, there is such an emphasis on diastolic pressure that the patients are not getting their systolic blood pressures adequately controlled. The fact is that people over the age of 50 probably do not even need to measure diastolic pressure, it is only the systolic blood pressure that should be the focus. Dear Dr KK Aggarwal, Greetings, I wish you and your family a very happy prosperous New Year 2015. From: Dr JS Bhargava, Ex Prof of Surgery, PGIMS, Rohtak and Family.